Note: This document does not replace the Cisco ACS formal documentation. Please refer to Cisco ACS documentation for information about other topics. 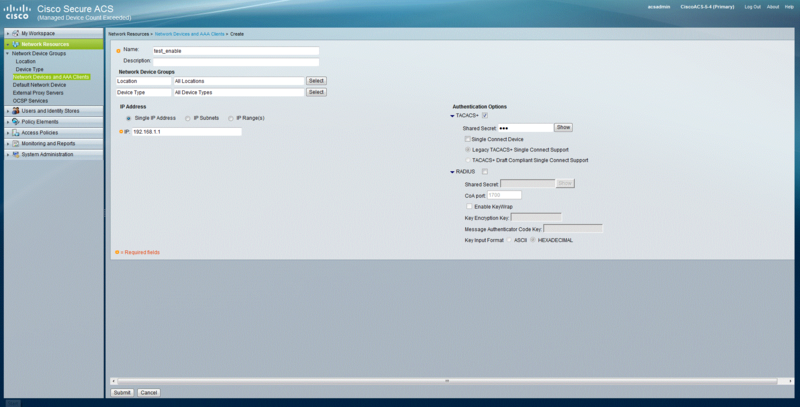 This document was created based on Check Point lab and specific Cisco ACS version. In Gaia OS, it is possible to authenticate with non-local users that are configured on TACACS+ or RADIUS servers. The most popular TACACS+ server is the Cisco ACS server. 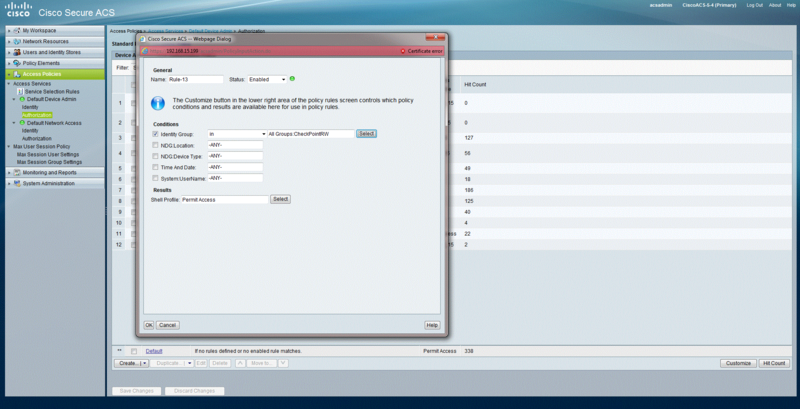 This article shows how to configure the Cisco ACS server to work with Gaia OS (this information was documented based on the Check Point lab). Note: The default shell /bin/bash for TACACS+ users is not supported, and TACP-0 and TACP-15 roles are used for Privilege Escalation. 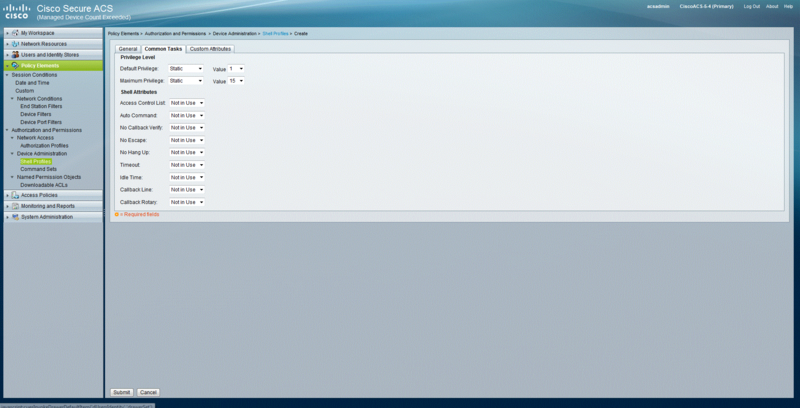 On the Cisco ACS server, go to 'Network Resources' > 'Network Devices and AAA Clients', and 'Create' new network device. Go to 'Users and Identity Stores' > 'Identity Groups', and create a new Identity group with a desired name (e.g., "CheckPointRW"). Go to 'Users and Identity Stores' > 'Internal Identity Stores' > 'Users'. The user should be part of the Identity group added in the previous step. enable password (for the enabling privileged level). Go to 'Policy Elements' > 'Authorization and Permissions' > 'Device Administration' > 'Shell Profiles'. 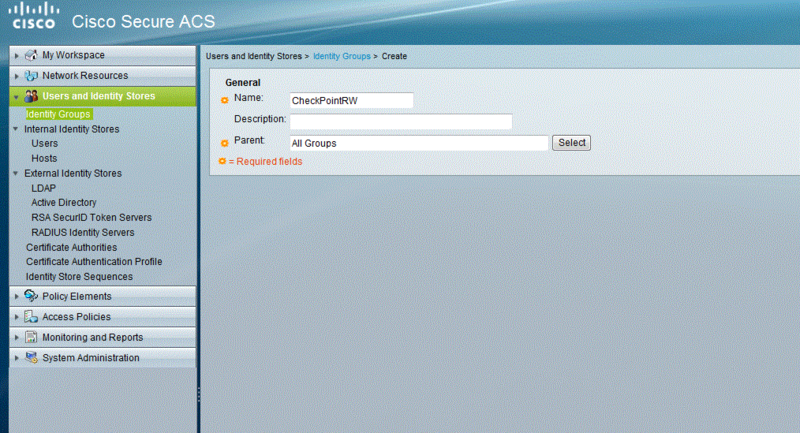 Add a shell profile to assign to the authenticated TACACS+ users. In 'Commands and Tasks', set the maximum privileged level as "15". Go to 'Access Policies' > 'Access Service' > 'Default Device Admin' > 'Authorization' > create new rule. The rule will be: if the authenticated user is in the Identity group (e.g., "CheckPointRW"), then the result will be the shell profile created in the previous step. To be able to login to Gaia OS with TACACS+ user, configure the role TACP-0, and for every privileged level "X" that will be used with tacacs_enable, define the rule TACP-"X". Refer to the Gaia Administration Guide (R77.X, R80.10). 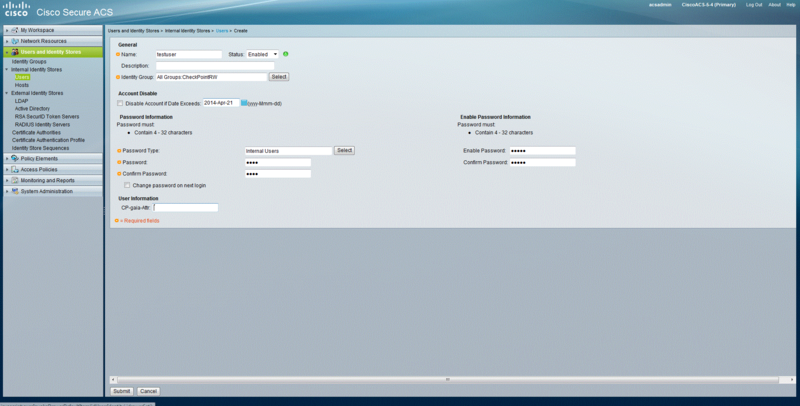 Use the enable password configured on the ACS server. The enable password is valid for all privileged levels.